Kraft Foods' (KFT) latest bid to acquire Cadbury (CBY) isn't sufficiently sweet for the U.K. confectionery company to even consider. That's the latest word from a Cadbury official who called Kraft's latest approximately $16 billion bid too small, claiming it failed to take account of the full value of the company.%%DynaPub-Enhancement class="enhancement contentType-HTML Content fragmentId-1 payloadId-61603 alignment-right size-small"%% "Kraft has once again missed the point," a Cadbury spokesman told CNN. "Despite this tinkering, the Kraft offer remains unchanged and derisory, with less than half the consideration in cash." The offer is Kraft's third since it launched its first informal takeover bid for Cadbury in September. Kraft didn't increase the overall value of its bid, but said it boosted the cash portion of the offer. Warren Buffett, Chairman of Berkshire Hathaway (BRKA), Kraft's largest shareholder, said Tuesday he voted against Kraft's newest cash-and-stock offer, saying the deal would hurt Kraft shareholders. Buffett owns a nearly 10% stake in Kraft, which is based in Northfield, Ill., and known for products such as Oreo cookies, Kraft cheeses and Ritz crackers. Kraft made the latest bid Tuesday shortly after it announced the $3.7 billion sale of its U.S. pizza business to Nestlé, using the proceeds from the sale to increase the amount of cash in its offer to buy Cadbury. 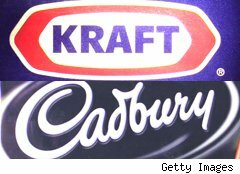 The bid would allow Cadbury shareholders to receive cash as well as Kraft shares should they accept the deal. "Kraft Foods is doing this because of the desire expressed by some Cadbury security holders to have a greater proportion of the offer in cash," Kraft said in a statement. Kraft also extended the offer until Feb. 2, as the original bid expired Jan. 5. Nestlé, thought to be considering a bid for Cadbury, said Tuesday it wasn't interested. The announcement resulted in a downgrade in Cadbury shares by Jeffries International to hold from buy, MarketWatch.com reported. With Nestlé out of the picture and Kraft's fresh bid rejected, a joint bid by Hershey (HSY) and Italy's Ferrero remains the only credible alternative, the broker said. Given Buffett's rejection of the deal, it remains unclear whether Kraft will have the stomach to again sweeten its offer. Buffett previously expressed confidence in Kraft Chief Executive Irene Rosenfeld's decision to pursue Cadbury, telling CNBC in September that Kraft was disadvantaged in its bid by its undervalued shares. "If part of your currency is a stock that's worth more money than it's selling for," Buffett said, "it makes it a tough game." In voting against the latest bid, Buffett signaled that he's not interested in a deal that values Kraft stock at less than the average $33 a share he paid in 2007 for the bulk of his holdings. "Kraft stock, at its current price of $27, is a very expensive 'currency' to be used in an acquisition," Buffett said in a statement Tuesday morning. He added that in 2007, Kraft spent $3.6 billion to repurchase shares at about $33 a share, "presumably because the directors and management thought the shares to be worth more."